When four-year old Carter Piglowski was admitted to Helen DeVos Children’s Hospital in Grand Rapids, Michigan the family had no idea of what was ahead. They were thankful for the Pediatric Oncology Resource Team (PORT) who brought bags of essentials like toiletries, snacks and other items for newly diagnosed patients. Chemo Duck was tucked among the goodies. Carter named his newest companion Coocoo Doodles. 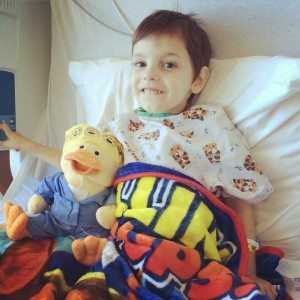 Carter was diagnosed in September 2015 with Acute Lymphoblastic Leukemia (ALL) and was not accustomed to all the medical personnel and treatments. 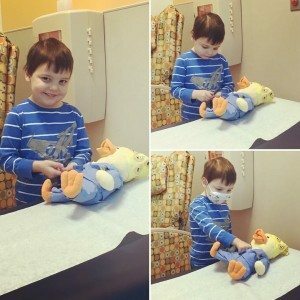 His mom noticed after being introduced to Chemo Duck, his anxiety lessened. Mandy said Carter loves bringing his Chemo Duck to family functions and showing everyone what happens when he is at clinic or in the hospital. “He has taught everyone how to clean his tubbies and how they put his medicine in them,” she said. The family, who lives in Mount Pleasant, Michigan, has a nearly two-hour drive to the hospital where Carter is treated. 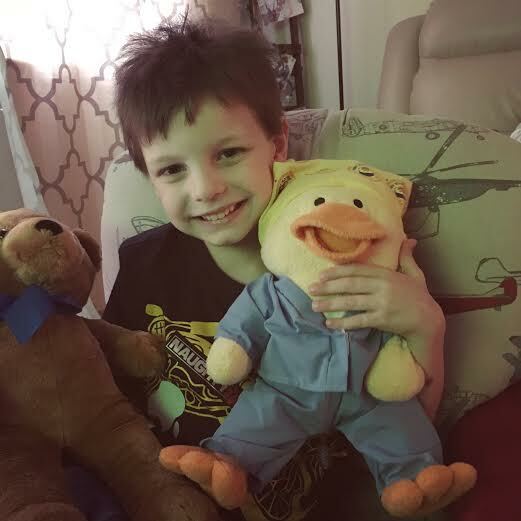 During the ride, Mandy says she can tell Carter finds comfort in his Chemo Duck.